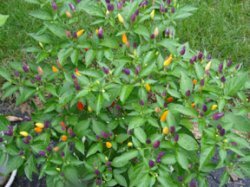 Twilight Chillies mature through a rainbow of colors from purple to yellow to orange and finally red - it looks fantastic and is also suitable for use as a lovely patio container plant. This plant is really impressive with the array of colored fruit towards the end of the season. One friend brought it inside and is enjoying the colorful fruits all season The pods are of medium heat level and are great fresh or frozen.